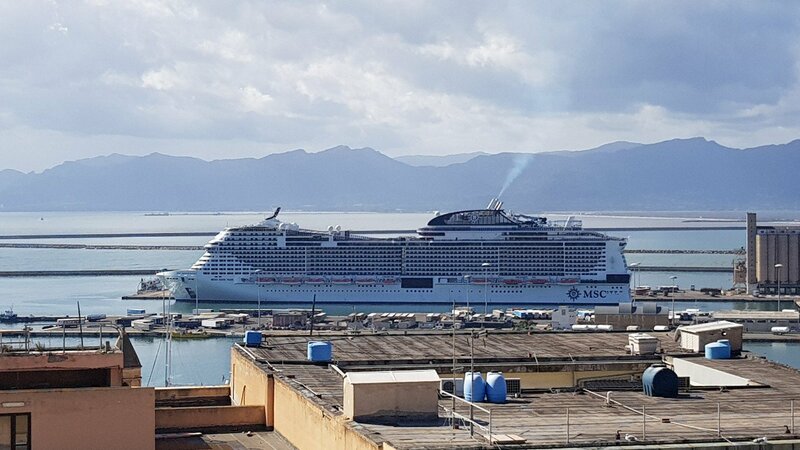 At the time of writing, the MSC Meraviglia was the 5th largest cruise ship in the world. 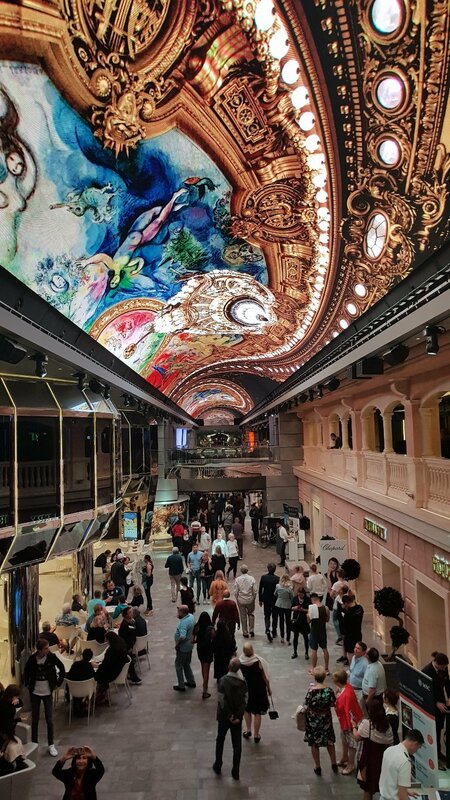 It has been launched in 2017 with an interesting collaboration with Samsung to create a massive rooftop screen for their indoor promenade. And I must admit this was very impressive. In fact, it was one of the few things in my opinion that makes the Meraviglia unique and special compared to other ships around. So how is it to sail one of the biggest cruise ships on the world? Nothing much to be honest. 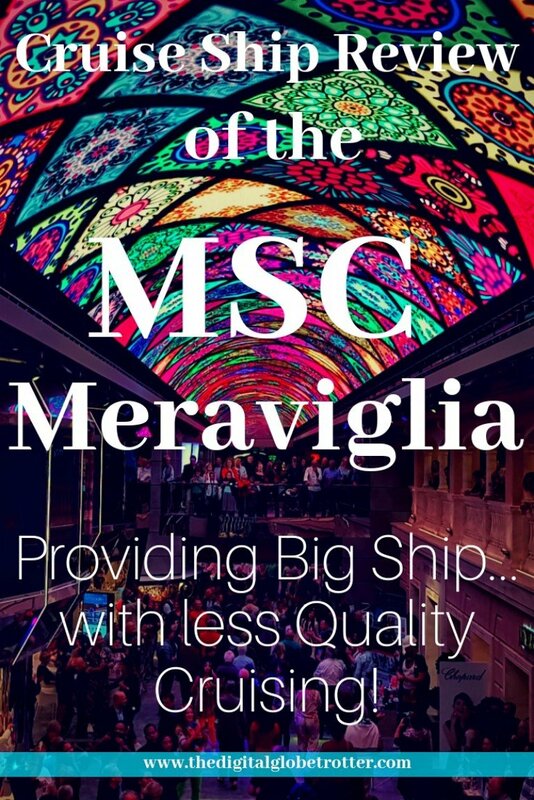 Actually, in the case of the Meraviglia, the fact that it is so big is a bad thing because the way they orient their business is pretty obvious: Stuffing as many people on board as possible, with the same shared and common areas as smaller ships. And in my experience, this was very frustrating, probably the worst overcrowded experience I have had on any ship! 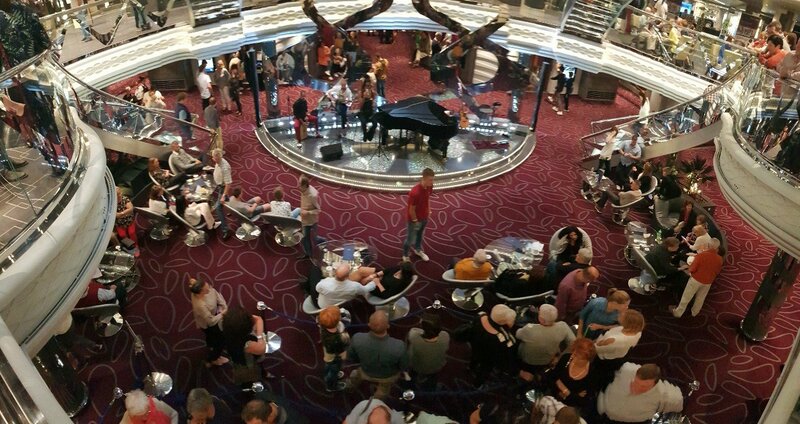 Most other cruise lines will have a lot of onboard bars here and there, but in the case of the Meraviglia, there is very little common social area and people are left standing as there is no place to sit anywhere. This also reflects on the very poor entertainment onboard sitting areas. A show in the atrium where there is nowhere to sit is unacceptable. I will cover this poor infrastructure choice in the entertainment section. The other thing to note about onboard entertainment is the poor selection of sitting areas to assist the live shows. One of the three areas was the atrium, where there are only about 25 places to sit and the queue for the reception is going through the sitting area. Passengers wanting to listen to the music in the atrium will have to stay standing in the middle of the hallway! That, in my opinion, was unacceptable and a very poor choice of setup. Additionally, the Meraviglia was the first ship I have seen where the nightclub was filled every night with kids of 10 to 17! I even attested a 4 years old kid with their parents on the dance floor with the baby cart… On all other ships I have been on, the club is always for adults only, and alcohol sometimes for 21+ only. By allowing kids to the nightclub, adults would rather not go and leave the kids jumping on the dance floor. Their kids policy would also be applied to the Gym, where even 8 years old would be left playing around with the machines. Something that would be considered scandalous on any American ships, prone to lawsuits if a kid would be hurt. Another low score here, as rating anything higher would be disrespectful for the amazing shows I have seen on other companies like RCCL and Norwegian. The first thing that I could not understand, was that the theater was tiny, going along with the philosophy stated before of more passengers for less quality in common areas! How in the world would they have the 5th largest ship on the world with a theater fitting on one single floor! They had to present the nightly show at three different times to accommodate everybody, and it was always hard to find space, especially with their system of having to reserve nightly. The one thing that made me not score lower is the big screens used in the background, provided with their collaboration with Samsung. It was pretty impressive and adding possibilities to the show. In general, the rooms were very comfortable mostly because of the ship being new. Room service was also standard and nothing more, nothing less, than most other cruise companies. The advantage of having a new ship will reflect in the amenities of the room, like its USB ports which are a good addition with nowadays ship. Here again, I had the same experience as with other MSC ships I’ve been on. The quality of the service and attention you receive from the crew will be of much lower quality of American based companies such as RCCL, NCL, and Carnival. The service is based out of European standards (Italian standards to be precise) and don’t expect any extra smiles. I even got in an argument with my waiter which started yelling at me as soon as I had requested something from him. He became aggressive in the instant of a second, which on any other cruise ship would be totally unacceptable. However, It was handled by a manager but I never received an apology from the waiter nor have I heard again about the incident. Overall, My understanding is that the standards imposed by MSC’s management on their crew is not strict enough, and this reflects in the way they behave towards the passengers. 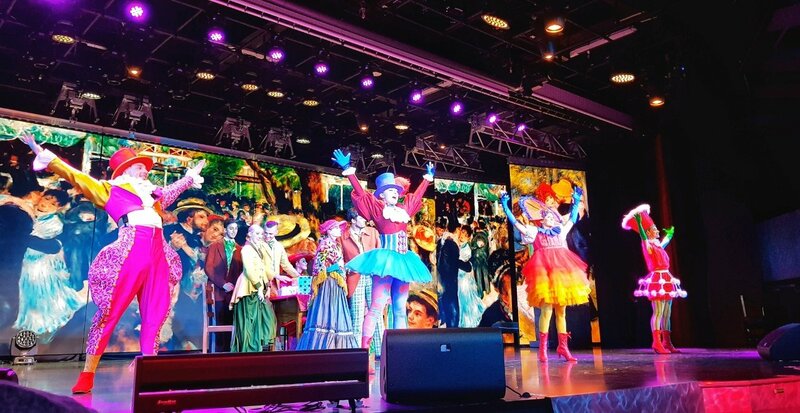 Even the entertainment team would just do their 30 minute dancing with the passengers every night and disappear without legitimately interacting personally with guests. My main concern was the sense of arrogance that could be felt from the Italian crew, mostly the ones wearing white uniforms. They act like they own the place, feel like they hate passengers and make them feel uncomfortable at times. This is a point I’ve heard from other passengers as well, and something I had noted previously. I guess this is an Italian thing as the Indonesian and Philippino crew were great, as always. On any other cruise line, you wouldn’t see this kind of unwelcoming behavior, it would be out of bounds. Again, one would have to have sailed on other cruise lines to see the difference and even though I sound critical here, I must do so as I am comparing my experience on the Meraviglia with all the excellent other 20 ships or so I have sailed in the past. The food in the restaurants was average at most. As I have sailed on Norwegian just 2 days after disembarking the Meraviglia, the difference was massive. Norwegian will provide much more quality dishes compared to The Meraviglia, Especially at the Buffet. The buffet on the Meraviglia was very disappointing in my opinion, where they left the same meals from lunch and for dinner too! 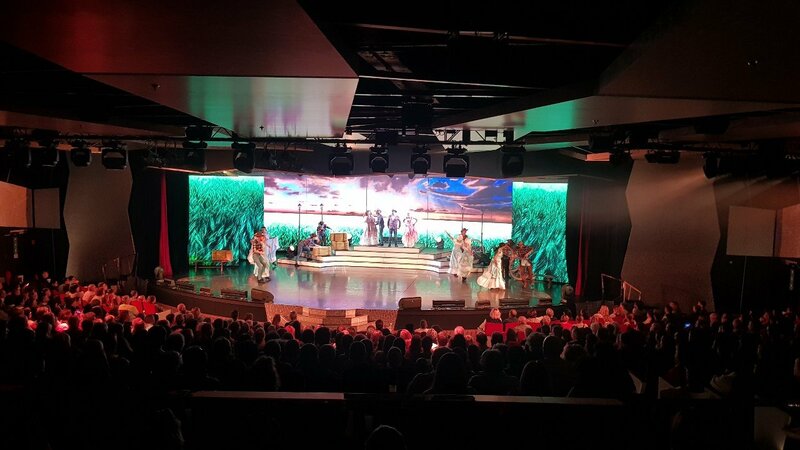 That is unseen on any other cruise lines, where the night buffet is always changed and usually of higher quality at night for those who don’t feel like sitting down in the main dining room. I believe the strategy behind this is to get more people to choose their premium paid restaurants after having a negative experience at the complimentary options. MSC is known for its international passengers which diverges from the common North American retiree crowd. This is also true on the Meraviglia except that since I was on a western European route, and considering the ship was picking up and dropping off passengers every single day between Italy, Spain, and France, it created a very distinct feel. The ship was very divided between the 3 languages, even in the dining room. Many people did not speak English and preferred to interact with their fellow citizens than to mix all together like on most cruises. This created a feeling of individuality that I didn’t like in general. I personally much prefer cruises boarding everybody in one port and doing all the trip together. 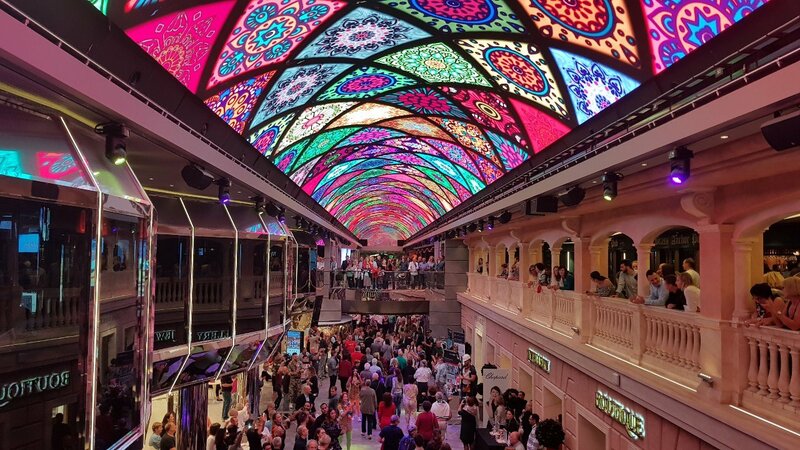 It felt a bit like a commercial ferry at times and being such a massive ship, it meant seeing new people, new faces all the time, without creating bonds that are crucial on cruises. Finally, it is to note that the age was young in general, with many families and a lot of kids! Cruise ships are a logistics mastery, an art that was mastered by company’s like Royal Carribean, Carnival, and Norwegian. MSC is relatively new to the game, and intending to attack the supersized ships market with their new “super ships” is somewhat out of their league. Disorganized and mismanaged with poor service, they just can’t rival with the big guys just by having a big ship. What they achieved instead is a massive boat, lodging to many people and sharing the same common areas as the small ships, creating an overcrowded and suffocating atmosphere. Cutting corners here and there, trying to imitate the big guys but providing lower quality without innovating. The Meraviglia is set to move out of Europe and be stationed in the USA in 2019. They will need to step up their game and increase their quality if they want to rival with the incredible experience that other companies provide. They will need to do all that is possible within their reach to please their guests, but this will be hard in the American market where most passengers have already seen what is offered on other lines, and they will expect more. 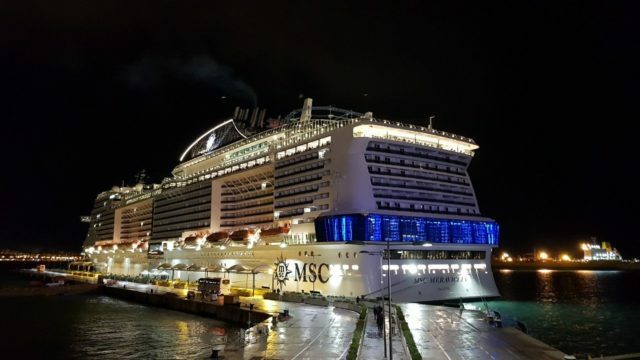 Still, MSC can try to up their game but in my opinion, the damage is already done as the single biggest problem is the design of the boat: A massive boat with too little common areas. 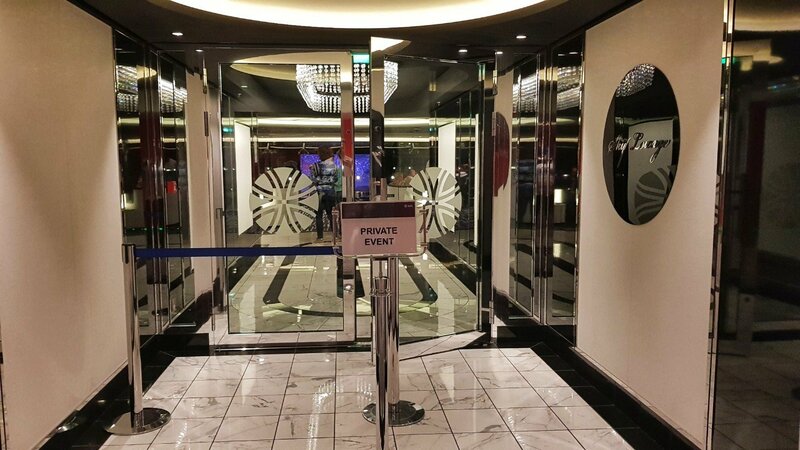 At least, on the MSC Seaside and Seaview, they have managed to create a nice use of their space. 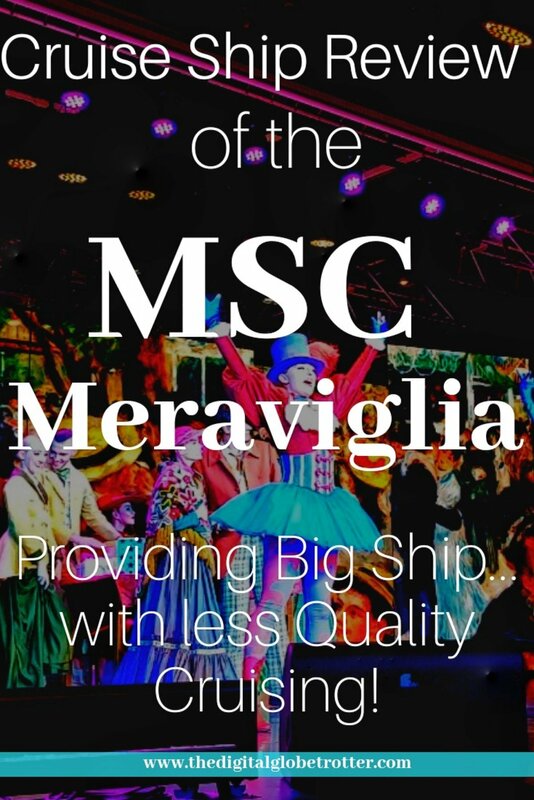 But not on the Meraviglia… In my opinion, MSC should just accept their lower quality provided and charge much less than the competition to fill their massive boats, becoming somewhat of a low-cost cruise line, such as the Ryanair of the seas.